Objective: To investigate the role of TGF-β1 on Epithelial Mesenchymal Transition (EMT) and invasion ability in human bladder cancer cell line T24. Methods: After pre-treatment with TGF-β1 of different concentrations for 24 h, we observed the morphological changes of T24 cells under phase-contrast microscopy. The mRNA and protein expression levels of EMT relative marker E-cadherin and Vimentin were detected by RT-PCR and Western blot. The effect of TGF-β1 on migration and invasion abilities of T2 cell line was detected with transwell migration and invasion assay. Results: Results demonstrated that TGF-β1 could induce epithelial-mesenchymal transition in T24 cells. 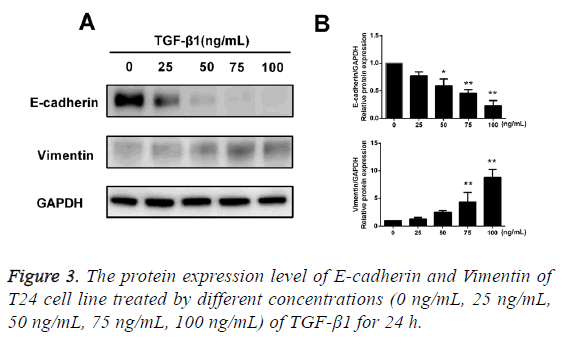 The mRNA and protein levels of epithelial marker E-cadherin were downregulated by TGF-β1, whereas those of mesenchymal maker protein Vimentin were upregulated. Furthermore, it is noted that TGF-β1 could significantly enhance the migration and invasion ability of T24 cells, which, however, could be effectively reversed by TGF-β1 inhibitor LY2109761. Conclusion: TGF-β1 can enhance migration and invasion ability of T24 cells by inducing epithelial mesenchymal transition. Bladder cancer, Epithelial mesenchymal transformation (EMT), Transforming growth factor (TGF), Invasion. Bladder cancer, as the most common malignant tumor in urinary tract, has ranked first in terms of incidence rate in all of the tumor in urinary system in China, and is frequently seen in aging males between 50 and 70 y old [1,2]. At present, major treatment methods in clinical practice are developed on basis of transurethral resection with the bladder being preserved in combination with radiotherapy or chemotherapy. Frequent recurrence has been confirmed after various bladder-preserving surgeries due to the high invasive ability of bladder cancer cells, which can easily result in infiltration and distant metastasis in advanced stage [3,4]. Thus, figuring out the pathogenesis of distant invasion and metastasis of bladder cancer is vital to improvement of patient’s prognosis. Distant metastasis and invasion of malignant tumors are commonly affected by multiple genes and factors, and Epithelial-Mesenchymal Transition (EMT) has become a hotspot in research of tumor in recent years. EMT refers that under some special physiological or pathophysiological conditions, cells originated from epithelium gradually gain the mesenchymal characteristics with the loss of epithelial phenotype [5-7]. In the occurrence of EMT, polarity is disappearing in the epithelial cells, and the connection of these cells without polarity with peripheral cells and cytoplasm will be reduced, which can alter the cytoskeleton and enhance the migration and mobilization abilities of cells. At the same time, mesenchymal-characteristic changes are also seen in phenotype of epithelial cells. Not only be the EMT involved in the earlystage embryonic development and organ formation, but it can also participate in the occurrence and progression of multiple epithelium-originated malignant tumors through promoting the invasion and metastasis of cells [8,9]. Transforming Growth Factor (TGF) is the polypeptide cytokine with multiple biological effects secreted by multiple cells, and involved in a variety of biological events, such as cell proliferation, apoptosis, differentiation, invasion and metastasis [10,11]. Besides, TGF can also regulate the transcription and expression of downstream target genes, thus being involved in regulation of angiogenesis, damage-repair fibrosis and tumorigenesis [12,13]. Previous studies have shown that TGF- β signal pathway has been widely recognized as one of the signal pathways mediating and regulating the EMT [14,15]. In this study, we aimed to investigate the effect of EMT in human bladder squamous cell carcinoma T24 induced by TGF- β1 on invasion and metastasis capability of cells. Human bladder squamous cell carcinoma T24 cells were purchased from Shanghai Institutes for Biological Sciences, CAS; TGF-β1 was purchased from R and D; LY2109761, the inhibitor of TGF-β1, was purchased from Selleck; TRIzol RNA extraction kit was purchased from Takara; primer sequences were synthesized by Tsingke Biotech (Shanghai) Co., Ltd.; monoclonal rabbit anti-human E-cadherin antibody and horseradish peroxidase-labelled goat anti-mouse or rabbit IgG were purchased from Cell Signaling Technology; monoclonal mouse anti-human Vimentin was purchased from Santa Cruz; protein marker was purchased from Thermo Fisher; ECL kit was purchased from Millipore; bovine serum was purchased from GIBCO; RPMI-1640 medium was purchased from HYCLONE; RIPA and BCA protein quantification kit were purchased from Beyotime Biotech Institute; 24-well Transwell chamber (8 μm) was purchased from Corning Costar; Matrigel used in invasion experiment was purchased from BD. T24 cells were cultured in a cell incubator (37°C, 5% CO2 and saturated humidity) supplemented with 10% Foetal Bovine Serum (FBS), 100 U/mL penicillin, 100 μg/mL gentamicin and RPMI-1640 medium, and then digested using 0.25% trypsin for passage. After cell infusion reached 70-80%, cells were starved using serum-free medium followed by treatment of TGF-β1 for 24 h. Cells were divided into groups according to the requirement of experiment. Morphological observation of cells: T24 cells were digested, passaged and inoculated onto a 6-well plate, and cells adhering to the wall were starved using serum-free culture medium overnight. Up to next day, TGF-β1 was added into the cells for 48 h of treatment, and then cells were placed under the phasecontrast microscope for observing and photographing the changes in cell morphology. RT-PCR was used for measuring the miRNA expressions of E-cadherin and Vimentin: Cells in each group were washed using pre-cooled PBS three times; in each well, 1 mL Trizol RNA extraction solution was added for extraction of total RNA in cells according to the procedures of instruction; A260/A280 ratio was measured via ultraviolet spectrometer to calculate the concentration of RNA, and this step would be repeated for 3 times; reverse transcription of extracted RNA was performed for preparation of cDNA using the reverse-transcription kit followed by PCR amplification. Primers used in PCR were synthesized by Invitrogen (Shanghai) and the sequences are listed as follows: GAPDH, forward primer 5'- ATGGGGAAGGTGAAGGTCG-3', backward primer 5'- GGGTCATTGATGGCAACAATATC-3'; β-catenin, forward primer 5'-GCTGCTGTTTTGTTCCGAATGT-3', backward primer 5'-GCCATTGGCTCTGTTCTGAAGA-3'; Vimentin, forward primer 5'-CCAAACTTTTCCTCCCTGAACC-3', backward primer 5'-GTGATGCTGAGAAGTTTCGTTGA-3'; E-cadherin, forward primer 5’- GTACTTGTAATGACACATCTC-3’, backward primer 5’- TGCCAGTITCTGCATCTGC-3’. Reaction conditions were set as follows: initial denaturation at 95°C for 3 min; 94°C for 30 s, 48°C for 30 s, 72°C for 1 min, and the amplification was performed for 35 cycles; extension at 72°C for 10 min. For PCR product, 1.5% agarose gel electrophoresis was performed, and the gels were placed into the gel imager for imaging and scanning of gray value. This step was repeated for 3 times. TGF-β1 in different concentrations (0 ng/mL, 1 ng/mL, 5 ng/mL and 10 ng/mL) was used to process the cells for 48 h, and cells adhering to the wall of culture flask were washed using pre-heated PBS and transferred into the EP tube for centrifuge at 12000 rpm for 5 min. The supernatant was discarded, and cells collected from the sediment were lysed using RIPA solution. Supernatant was preserved at -20°C. Then, the sample was loaded for electrophoresis at 80 V for protein accumulation. Proteins were isolated and transferred onto the membrane followed by blocking using 5% skimmed milk. Respectively, monoclonal rabbit anti-human E-cadherin (1:1000), monoclonal mouse anti-human Fibronectin and Vimentin (1:100), polyclonal rabbit anti-human AKT and monoclonal mouse anti-human p-AKT (1:500) were added onto the membranes in each group for incubation at 4°C overnight. Thereafter, membranes were washed for 5 min on a decoloring shaker for 3 times. Horseradish peroxidase labelled goat anti-mouse or rabbit IgG was added onto the membrane for 1 h of incubation at room temperature followed by washing membrane using TBST for 5 min for a total of 3 times. Then, ECL solution was added onto the membrane for 1 min of reaction at room temperature followed by exposure under Xray, fixation and development. Cell migration and invasion experiments: a) Cell migration assay: T24 cells in logarithmic phase were starved in serumfree RPMI-1640 medium for 24 h followed by digestion using 0.25% EDTA-trypsin, and single-cell suspension was prepared in serum-free RPMI-1640 medium, in which cell density was adjusted to 3 × 105/mL. According to the detection of Trypan blue, cells with viability above 95% could be used in following experiment. In the upper chamber of each Transwell, 200 μL serum-free cell suspension was added, and according to the requirement of each group, drugs were added. For groups with drug administration, 3 replicative wells were set. In the lower chamber of Transwell, RPMI-1640 containing 10% FBS was added into each well (600 μL/well) for 24 h of incubation in an incubator. Chambers were removed and washed using PBS twice to eliminate the culture medium. After cells that failed to pass into the upper chamber were scrubbed using a wet cotton swab, cells were fixed in methanol for 20 min followed by airdrying at room temperature. Furthermore, cells were stained using crystal violet for 20 min. After cells were stained, they were placed under the inverted microscope for measuring the quantity of cells that passed through the membrane, and cells spread in 5 high-magnification visions (400x), and the average served as the result. b) Cell invasion experiment: Matrigel was melted at 4°C prior to experiment, and 40 μL dilution of Matrigel (Matrigel: serum-free medium=1:3) was spread on surface of polycarbonate microporous membrane, which was then preserved in an incubator for 4 h of coagulation for 4 h. The density of cells that were inoculated was adjusted to 2 × 105/mL and other procedures were the same as those in the migration assay. All data were presented as (x̄ ± s). Statistical analysis was performed using SPSS 12.0. Student-Newman-Keuls test was performed for intergroup difference. p<0.05 suggested that the difference had statistical significance. After TGF-β1 in 100 ng/mL was added in T24 cells for 24 h of stimuli, cells were placed under the inverted microscope, and we found that T24 cells in the control group were in typical epithelial-structure, close arrangement and regular morphology, while in the TGF-β1 group, most of the T24 cells were extended in fusiform-shape with obvious mesenchymal morphology (Figure 1). 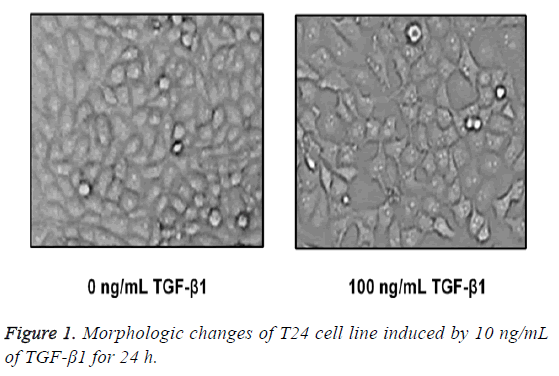 Figure 1: Morphologic changes of T24 cell line induced by 10 ng/mL of TGF-β1 for 24 h.
After TGF-β1 in varying concentrations (0 ng/mL, 25 ng/mL, 50 ng/mL, 75 ng/mL and 100 ng/mL) was added into cells for 24 h of incubation, the results of RT-PCR showed that compared with the blank control group, mRNA expression of E-cadherin of T24 cells in the TGF-β1 group that were treated using TGF-β1 was decreased with the increase of drug concentration, while the mRNA expression of Vimentin was increased against the augmentation of drug concentration, and the difference had statistical significance (p<0.05; Figure 2). Figure 2: The mRNA expression level of E-cadherin and Vimentin of T24 cell line treated by different concentrations (0 ng/mL, 1 ng/mL, 5 ng/mL, 10 ng/mL) of TGF-β1 for 24 h.
After TGF-β1 in varying concentrations (0 ng/mL, 25 ng/mL, 50 ng/mL, 75 ng/mL and 100 ng/mL) was added into cells for 24 h of incubation, the results of Western blotting assay showed that after treatment of TGF-β1, the protein expression of E-cadherin in T24 cells was reduced with an increase in concentration of TGF-β1, while the protein expression of Vimentin was increased with an increase in concentration of TGF-β1, and the difference had statistical significance (p<0.05; Figure 3). Figure 3: The protein expression level of E-cadherin and Vimentin of T24 cell line treated by different concentrations (0 ng/mL, 25 ng/mL, 50 ng/mL, 75 ng/mL, 100 ng/mL) of TGF-β1 for 24 h.
After T24 cell strain was processed using 10 ng/mL TGF-β1 for 24 h, we found that in comparison with the control group, the mRNA and protein expressions of E-cadherin were obviously decreased, while those of Vimentin were significantly increased, and the differences had statistical significance (p<0.05). However, LY2109761, i.e. the inhibitor of TGF-β1 in 10 ng/mL, could significantly reverse the EMT and the difference had statistical significance (p<0.05; Figures 4 and 5). Figure 4: TGF-β1 inhibitor LY2109761 reverse TGF-β1 triggered EMT process. Figure 5: TGF-β1 inhibitor LY2109761 reverse TGF-β1 triggered EMT process. In transwell migration experiment, we found that in comparison with the control group, the migration ability of T24 cell strain that received 24 h of treatment using TGF-β1 was significantly enhanced, and the difference had statistical significance (p<0.05), which, however, was reversed by administration of TGF-β1 inhibitor (LY2109761). The difference had statistical significance (p<0.05; Figure 6). Figure 6: TGF-β1 enhances the migration ability of T24 cell line (crystal violet staining × 200). In Transwell migration experiment, we found that in comparison with the control group, the invasion ability of T24 cell strain that received 24 h of treatment using TGF-β1 was significantly enhanced, and the difference had statistical significance (p<0.05), which, however, was reversed by administration of TGF-β1 inhibitor (LY2109761). The difference had statistical significance (p<0.05; Figure 7). Figure 7: TGF-β1 enhances the invasion ability of T24 cell line (crystal violet staining × 200). Bladder cancer ranks first in terms of incidence rate in all tumors of urinary system in China. In addition, among all diseases in urogenital system, its incidence rate ranks second with the second highest mortality rate. Occurrence and progression of bladder cancer are commonly regulated by a variety of factors and procedures with biological characteristics, like high malignancy, rapid local growth and susceptibility to invasion, metastasis and recurrence in advanced stage [16,17]. Bladder cancer is more susceptible to the pelvic and distant metastasis compared with other kinds of tumors in urogenital system. Previous studies revealed that 5 y survival rate of bladder cancer patients with lymphatic metastasis in pelvis is only 20 to 25% . Thus, how to discover and block the distant metastasis and invasion, and apply the effective treatment method of bladder cancer has been considered as the key to prophylaxis and treatment of bladder squamous cell carcinoma. Metastasis of malignant tumor is an intricate process regulated by a variety of genes and factors, i.e. firstly, the detachment of tumor cells from primary lesion followed by formation of metastatic lesion through blood circulation, which is realized by focal infiltration, hematogenous metastasis and cell proliferation [19,20]. More and more studies have reported that EMT is widely involved in the invasion and metastasis of multiple tumors, including breast cancer, cervical cancer, liver cancer and colorectal cancer [21-25]. In addition, the quantity of tumor cells with EMT in tumor tissues is closely associated with the degree of metastasis of lesion tissues. EMT has vital effects in various biological processes, such as embryogenesis and organ development, fibrosis in tissues and organs, and metastasis and invasion of lesion tissues. Some literatures have reported that snail and Slug are highly expressed in bladder squamous cell carcinoma, the indicators of EMT, but Ecadherin is poorly expressed, which is positively correlated with the prognosis of bladder squamous cell carcinoma . This confirms that the occurrence and progression of bladder squamous cell carcinoma come with the EMT. As one of the key members in superfamily of TGF-β, TGF-β1 is a kind of cytokines with multiple biological activities, and regulates the important physiological processes, including cell proliferation, apoptosis, differentiation and angiogenesis [27,28]. Besides, the key role of TGF-β1 as the major inducer in EMT has been recognized, and TGF-β1 regulate the whole process of occurrence and progression of EMT [14,29]. But, there remain no studies reporting whether TGF-β1 can induce the EMT in human bladder squamous cell carcinoma. Therefore, based on these discoveries, we inferred that TGF-β1 can induce EMT in human bladder squamous cell carcinoma T24 cells, thereby increasing the metastasis and invasion, and resulting in distant metastasis of tumors. In this study, we firstly verified whether TGF-β1 could induce the EMT in human bladder squamous cell carcinoma T24 cells, and the results showed that after cells were stimulated using 100 μg/L TGF-β1 for 24 h, variations in morphology of T24 cells were identified in these cells compared with the cells in negative blank control group, and those cells were in fusiform with an increase in intercellular distance and in free growth with typical feature of mesenchymal cells. This suggested that TGF-β1 can induce the typical EMT. During EMT, the expression of E-cadherin, as the major marker adhering to the epithelium, is downregulated, while the upregulation of Vimentin will result in a decreased intercellular adhesion, and increases in mobility and invasion ability of tumor cells, thus inducing the peripheral infiltration, growth and metastasis of tumor cells. Sequentially, we will further confirm whether EMT occurs in T24 cells that are treated by TGF-β1 at the protein and mRNA levels. After T24 cells were treated using TGF-β1 at different concentrations (0 ng/mL, 25 ng/mL, 50 ng/mL, 75 ng/mL and 100 ng/mL) for 24 h, the results of RTPCR and Western blotting assay showed that in the group of cells that were treated by TGF-β1 in concentration of 100 ng/mL for 24 h, the mRNA and protein expressions of Ecadherin in T24 cells were the lowest, while those of Vimentin in T24 cells were the highest, suggesting that TGF-β1 can successfully induce the EMT in human bladder squamous cell carcinoma T24 cells. After we confirmed that TGF-β1 can actually induce the EMT, we adopted the Transwell experiment to detect the changes in migration and invasion capability of T24 cells. In the group of T24 cells with treatment of TGF-β1 in concentration of 100 ng/mL compared with the blank control group, the migration and invasion abilities of T24 cells were obviously enhanced, which, however, could be effectively alleviated by the inhibitor of TGF-β1, LY2109761. This result further confirmed that TGF-β1 can induce the EMT, thereupon enhancing the migration and invasion abilities of T24 cells. In conclusion, we, in this paper, preliminarily confirmed that in human bladder squamous cell carcinoma T24 cell line, TGF-β1 can enhance the invasion and migration abilities through inducing the EMT, which is conducive to further understanding of pathogenesis of bladder squamous cell carcinoma. Hence, in-depth research on the roles and regulatory mechanism of EMT in occurrence and progression of bladder squamous cell carcinoma to figure out new treatment method for intervening in and reversing the EMT in tumor cells, decreasing the invasion and metastasis of tumor cells will provide new ideas and evidence for specific treatment of bladder squamous cell carcinoma. Thus, it has a great clinical significance and promising application prospect. Dobruch J, Daneshmand S, Fisch M, Lotan Y, Noon AP, Resnick MJ, Shariat SF, Zlotta AR, Boorjian SA. Gender and bladder cancer: A collaborative review of etiology, biology, and outcomes. Eur Urol 2016; 69: 300-310. Lombard AP, Mudryj M. The emerging role of the androgen receptor in bladder cancer. Endocr Relat Cancer 2015; 22: 265-277. Chou R, Selph SS, Buckley DI, Gustafson KS, Griffin JC, Grusing SE, Gore JL. Treatment of muscle-invasive bladder cancer: A systematic review. Cancer 2016; 122: 842-851. Zibelman M, Plimack ER. Systemic therapy for bladder cancer finally comes into a new age. Future Oncol 2016; 12: 2227-2242. Chen T, You Y, Jiang H, Wang ZZ. Epithelial-mesenchymal transition (EMT): A biological process in the development, stem cell differentiation, and tumorigenesis. J Cell Physiol 2017. Santamaria PG, Moreno-Bueno G, Portillo F, Cano A. EMT: Present and future in clinical oncology. Mol Oncol 2017. Smith BN, Bhowmick NA. Role of EMT in metastasis and therapy resistance. J Clin Med 2016; 5. Bill R, Christofori G. The relevance of EMT in breast cancer metastasis: Correlation or causality? FEBS Lett 2015; 589: 1577-1587. Makker A, Goel MM. Tumor progression, metastasis, and modulators of epithelial-mesenchymal transition in endometrioid endometrial carcinoma: an update. Endocr Relat Cancer 2016; 23: 85-111. Jung B, Staudacher JJ, Beauchamp D. Transforming growth factor beta superfamily signaling in development of colorectal cancer. Gastroenterol 2017; 152: 36-52. Lee C, Zhang Q, Kozlowski J, Brendler C, Dash A, McClelland M, Mercola D. Natural products and transforming growth factor-beta (TGF-beta) signaling in cancer development and progression. Curr Cancer Drug Targets 2013; 13: 500-505. Fabregat I, Fernando J, Mainez J, Sancho P. TGF-beta signaling in cancer treatment. Curr Pharm Des 2014; 20: 2934-2947. Hawinkels LJ, Ten Dijke P. Exploring anti-TGF-beta therapies in cancer and fibrosis. Growth Factors 2011; 29: 140-152. Miyazono K. Transforming growth factor-beta signaling in epithelial-mesenchymal transition and progression of cancer. Proc Jpn Acad Ser B Phys Biol Sci 2009; 85: 314-323. Duan C, Li T, Liu L. Efficacy of limited fluid resuscitation in patients with hemorrhagic shock: a meta-analysis. Int J Clin Exp Med 2015; 8: 11645-11656. Zhang H, Fan Y, Xia L, Gao C, Tong X, Wang H, Sun L, Ji T, Jin M, Gu B, Fan B. The impact of advanced proteomics in the search for markers and therapeutic targets of bladder cancer. Tumour Biol 2017; 39. Zhang X, Han C, He J. Recent advances in the diagnosis and management of bladder cancer. Cell Biochem Biophys 2015; 73: 11-15. Zhang X, Zhang Y. Bladder cancer and genetic mutations. Cell Biochem Biophys 2015; 73: 65-69. Duan C, Chen K, Yang G, Li T, Liu L. HIF-1α regulates Cx40-dependent vasodilatation following hemorrhagic shock in rats. Am J Transl Res 2017; 9: 1277-1286. Shi H, Li J, Fu D. Process of hepatic metastasis from pancreatic cancer: biology with clinical significance. J Cancer Res Clin Oncol 2016; 142: 1137-1161. Yu JM, Sun W, Hua F, Xie J, Lin H, Zhou DD, Hu ZW. BCL6 induces EMT by promoting the ZEB1-mediated transcription repression of E-cadherin in breast cancer cells. Cancer Lett 2015; 365: 190-200. Zhang M, Song S, Yi Z, Zhao X, Fu L, Wang L, Ma C, Mao M, Xing Y, Zhu D. Human biliverdin reductase promotes EMT through the ERK1/2 signal pathway in breast cancer. Eur J Pharmacol 2016; 788: 45-53. Qureshi R, Arora H, Rizvi MA. EMT in cervical cancer: its role in tumour progression and response to therapy. Cancer Lett 2015; 356: 321-331. Yu M, Xue H, Wang Y, Shen Q, Jiang Q, Zhang X, Li K, Jia M, Jia J, Xu J, Tian Y. miR-345 inhibits tumor metastasis and EMT by targeting IRF1-mediated mTOR/STAT3/AKT pathway in hepatocellular carcinoma. Int J Oncol 2017; 50: 975-983. Li C, Ma H, Wang Y, Cao Z, Graves-Deal R, Powell AE, Starchenko A, Ayers GD, Washington MK, Kamath V, Desai K, Gerdes MJ. Excess PLAC8 promotes an unconventional ERK2-dependent EMT in colon cancer. J Clin Invest 2014; 124: 2172-2187. Wang Y, Shi J, Chai K, Ying X, Zhou BP. The role of snail in EMT and tumorigenesis. Curr Cancer Drug Targets 2013; 13: 963-972. Kamato D, Burch ML, Piva TJ, Rezaei HB, Rostam MA, Xu S, Zheng W, Little PJ, Osman N. Transforming growth factor-beta signalling: role and consequences of Smad linker region phosphorylation. Cell Signal 2013; 25: 2017-2024. Kelly RJ, Morris JC. Transforming growth factor-beta: a target for cancer therapy. J Immunotoxicol 2010; 7: 15-26. Katsuno Y, Lamouille S, Derynck R. TGF-beta signaling and epithelial-mesenchymal transition in cancer progression. Curr Opin Oncol 2013; 25: 76-84.